PROFILE: PROFITABILITY IMPROVEMENTS FROM ENHANCED BIOCHARS: RESULTS FROM A POTATO FARM IN BALLARAT, VICTORIA, AUSTRALIA. Although there is a great deal of research on the effect of enhanced biochars on crop growth, there are few studies looking at the overall impact on economic profitability for farmers. In 2013, a workshop on enhanced biochars was held in Ballarat, Australia and sponsored by BREAZE (Ballarat Renewable Energy and Zero Emissions) and CHAF (Central Highlands Agriculture Forum). After the workshop, participants were interested in setting up specific trials with enhanced biochars. Researcher René de Jong volunteered to organize trials with a local farmer who grew seed potatoes to test biochar/fertilizer blends on crop growth. These trials were conducted in a non-replicated potato trial in the potato growing region of Ballarat during 2013 – 2014. The potato crop was grown for certified seed potatoes; therefore, potato count and a high yield of small-sized potatoes were the desired outcomes. To supply the trials, Stephen Joseph working at the University of Newcastle (Australian and New South Wales) and Russell Burnett, of the Australian company BES, developed an enhanced biochar that was formulated to reduce the amount of fertilizer normally used by local potato farmers. The biochar feedstock was a combination of 60% wheat straw, 25% poultry manure, 5% clay, 4% basalt dust, and 6% wheat straw ash. The feedstock components were first mixed and then loaded into the hopper of a continuous trough pyrolyzer, and while still hot, the biochar surface was activated with phosphoric acid to bring the pH down to 6.8 (H2O). Coming out of the phosphoric acid, the biochar had 26% moisture content, and was air dried on a sheet of black plastic in direct sunlight at 20 degrees Celsius for at least an hour to dry to an estimated 8% moisture level prior to mixing with fertilizer. The potato trial was undertaken in a field 27 km north of Ballarat on a red ferrosol soil type; it was planted December 24, 2013. Since the desired potato size was small, three months after planting the crop, a product named Reglone was applied to the crop canopy to desiccate the leaves and stems of the potato plant, thereby stopping growth and controlling potato size. The potatoes were harvested a month later, on April 27, 2014. The field trial area was managed to a very high production standard, using a center pivot irrigation system and standard fertilizer application practices, as well as inputs to control pests, diseases, and weeds. The Nadine potato variety was grown due to its high yield for fresh market use and the farmer’s experience and familiarity with managing this variety. The farmer used a fertilizer mix of 778 kilograms per hectare, comprising a ratio of 7:14:14 (nitrogen: phosphorus: potassium). The treatments were applied by the farmer’s commercial equipment, and banded in the soil at approximately 50mm in 2 rows under and to each side of the planted potato seed. Note that the trials used a volume basis for comparison between fertilizer and biochar. The researcher, René de Jong, worked with the farmer to create biochar/fertilizer ratios based on volume (rather than weight) so the farmer did not have to change the planter settings. Mr. de Jong calculated the density of the biochar compared to the fertilizer and found that biochar was 51.7% of the weight of the fertilizer. The trials were set up as 50m long rows with two rows per treatment (7 treatments total as described above). The potatoes were harvested using the farmer’s harvesting equipment. To measure results, the researchers counted and weighed every potato in 15 m long sections. The three potato sizes included (1) under 120 grams (i.e. “small tubers”); (2) between 120 grams and 250 grams (i.e. “medium tubers”); and (3) greater than 250 grams (i.e. “large tubers”). Results were assessed as total yield (all potatoes measured), seed yield (small-sized potato tubers under 120 grams), and the numbers of tubers produced per plant, which is an important assessment for maximizing yield potential. The results below are expressed on the basis of yield per hectare, followed by an economic analysis using broadly representative pricing in the local potato market. The highest total yield was achieved by the treatment with 20% biochar and 80% fertilizer applied and the lowest yield was from the control (no biochar), representing the grower’s normal practice as represented to the right. See more information below for the effect of biochar and fertilizer treatments on total yield. 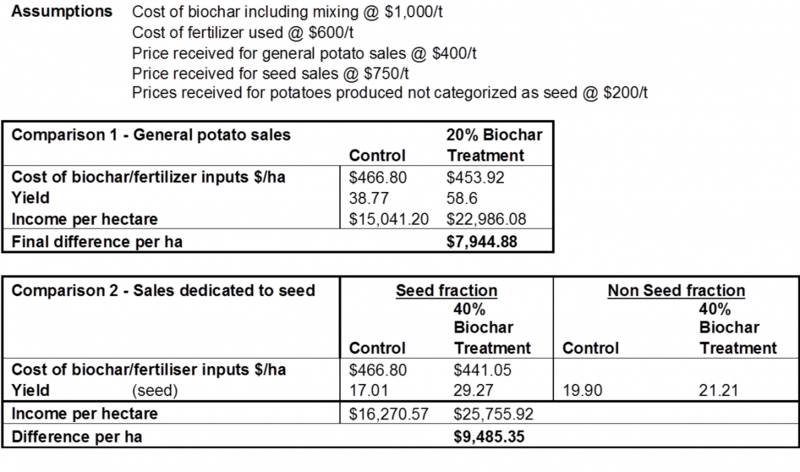 The following economic summary shows the cost/benefit differences due to the combination of the most profitable biochar and fertilizer treatments compared to the control in Australian dollars. This analysis assumes that the fertilizer and biochar were not compared by weight for application to the field, but by volume, so the farmer did not have to alter application methods. As an example, when 20% biochar/80% fertilizer rate was used, the weight of the total application decreased but volume stayed constant since biochar weighs much less than fertilizer. Thus, for the analysis below, although prices for fertilizer and biochar are by the tonne, the application was measured in volume. This trial was not replicated and while not statistically significant, the plot areas harvested represented a test to further assess potato crops using similar treatments and methodologies in future trials. The results shown in these trials are a combined effect of fertilizer and biochar and should in no way be viewed as biochar-only results. In the view of the authors, the possibility that the reduction in fertilizer caused a positive effect is equally as plausible as the biochar having a positive yield effect.